Government of the Pakistan, Office of the Chief Commissioner Islamabad Capital Territory Islamabad has announced 18 New Jobs in Daily Express Newspaper 22-03-2018. 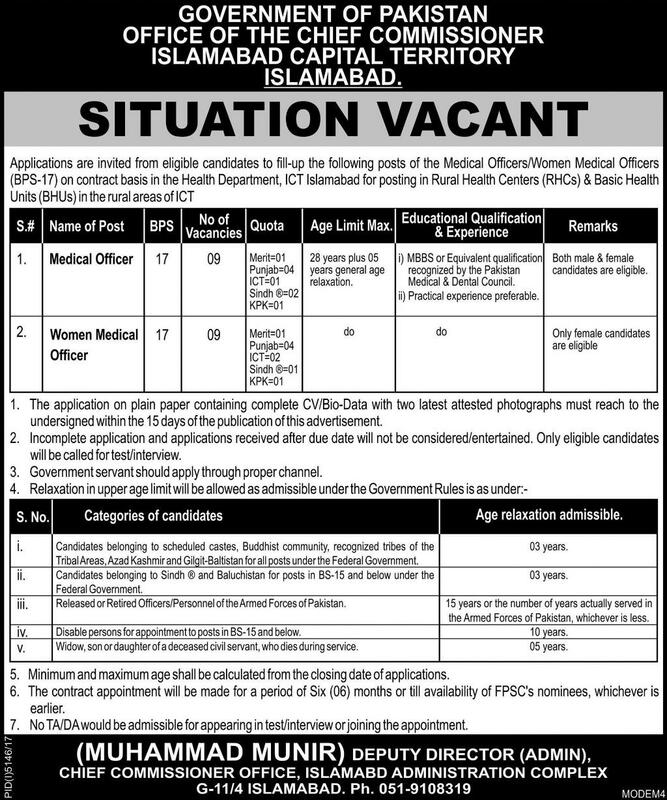 Applications are invited Against Medical Jobs in Islamabad 2018 from eligible candidates to fill-up the following posts of Medical Officer Male and Medical Officer Women on Contracts basis in Health Department, ICT Islamabad for posting in Rural Health Centers and Basic Health Units in the Rural Areas of Islamabad Capital Territory. The Application on plain paper containing complete CV/Bio-Data with two latest attested photographs must reach to the office of Deputy Director Admin Chief Commissioner Office Islamabad. Health Department Islamabad 18 Jobs Daily Express Newspaper 22 March 2018.